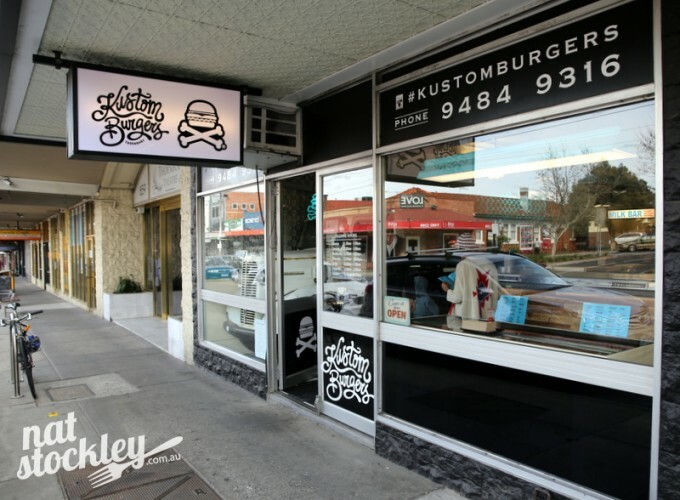 Kustom Burgers first came to my attention back in May 2014 whilst still in the fit-out phase. Reportedly owner Paul Hendrie spent two years meticulously creating the venue before finally opening to the public in early April 2015. 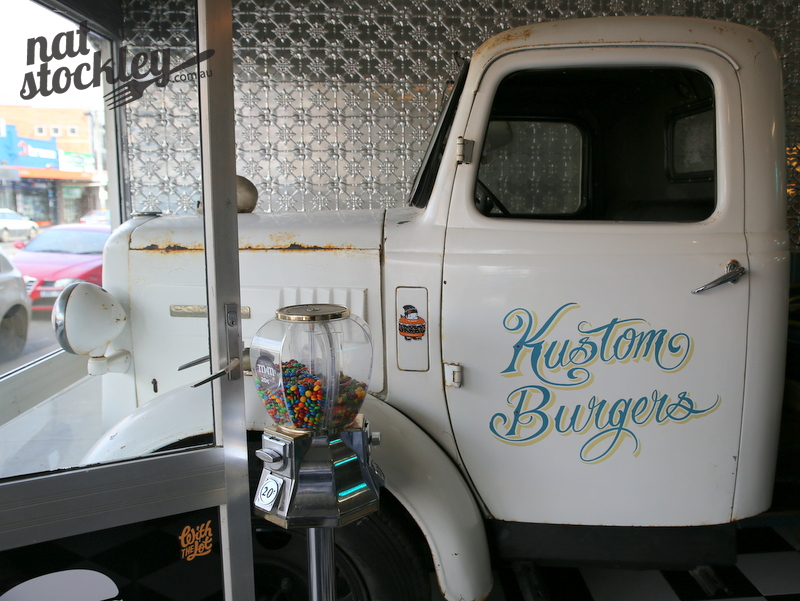 Hendrie is clearly a car enthusiast and the automotive theme is exhaustive (no pun intended) amidst the retro diner fit-out. It’s hard to miss the pick-up truck that takes pride of place at towards the front of the shop. 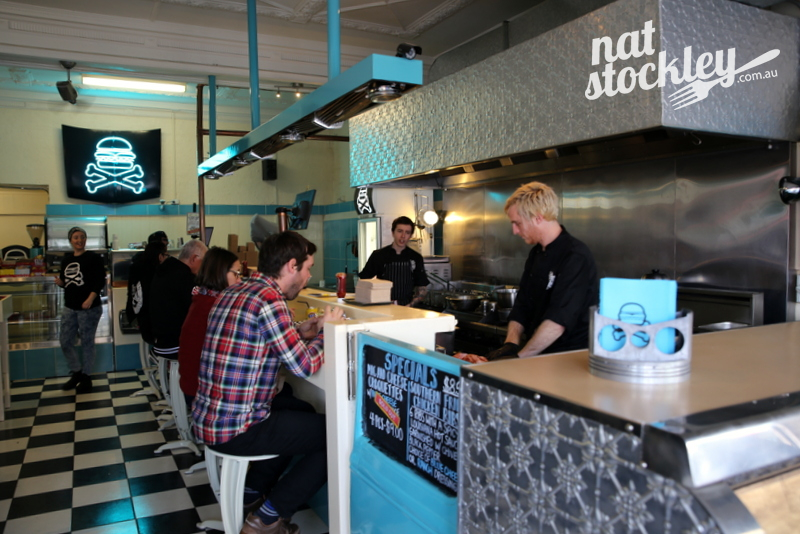 The unique shade of powder blue used throughout along with the chequered floor tiles and pressed metal sheeting all add to distinctive feel. The mac & cheese croquettes on the specials board must have proven popular as they’d already sold out when I arrive for lunch. Also on the specials list are southern fried chicken ribs with a choice of blue cheese or ranch dressing. They’re tempting, but on this occasion I’ve got my heart set on a burger. On the burger front, it’s mostly meaty creations, but there is a southern fried buttermilk chicken option along with a mushroom burger. A philly cheese steak roll, a chilli dog and Buffalo wings are also regular menu options together with a few sides (deep fried pickles, Kustom slaw & variations on fries). 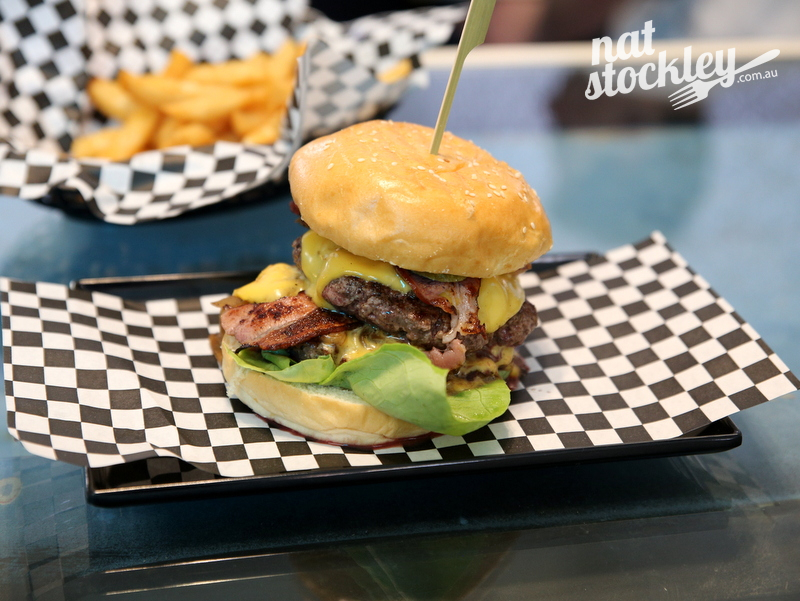 The basic burger is the F150, comprising a 150 gram grass fed all-beef patty, bacon, American cheese, pickles, cooked onion, lettuce, tomato sauce & Kustom mustard. I decide to up the ante and order the F250 which is essentially the F150 with a double patty, double cheese and double bacon. The menu advises that all patties are cooked medium and if you require them cooked any other way to let the staff know. When my burger arrives, I’m pleasantly surprised to see that it’s actually been cooked as stated. Unfortunately, the trade-off appears to be a case of “SBS” or soggy bun syndrome which makes eating the burger without losing the contents a little more testing. 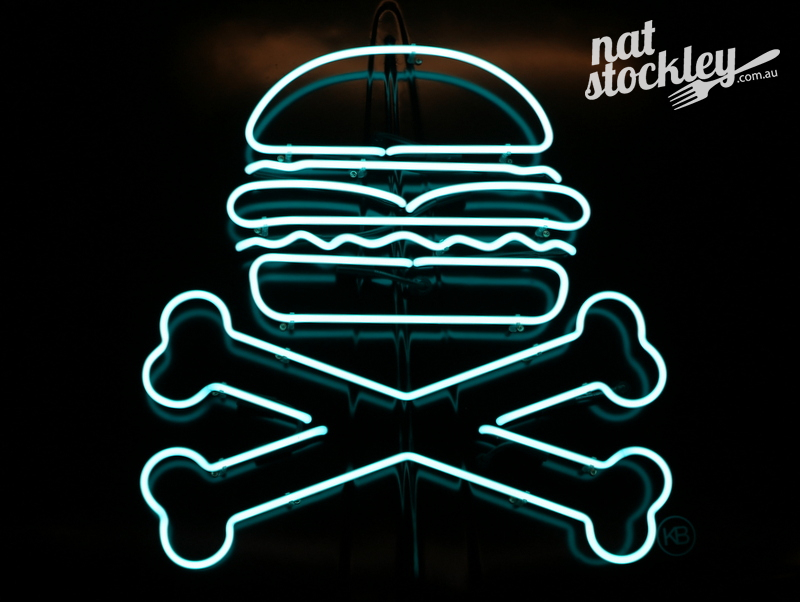 Nevertheless it’s still a very good burger, maybe not great, but certainly very good. 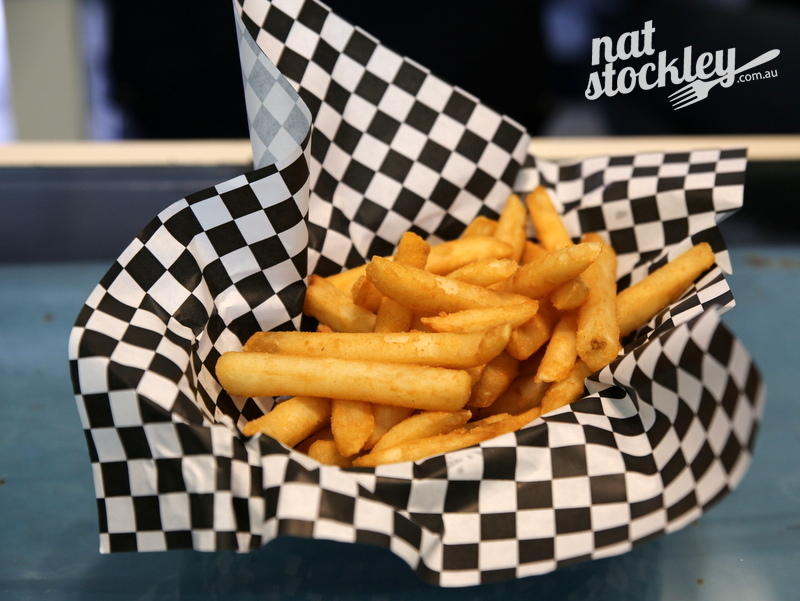 The hub cap fries, essentially a commercial variety of beer battered fries are hard to fault. Perhaps next time I’ll go the traditional old school bun instead of the brioche in an effort to avoid an “SBS” repeat.